As you embark on your search to find the best solar powered string lights, it is easy to feel overwhelmed. Many of the brands seem the same, so it is difficult to tell which is actually the best. After charging all day, solar string lights should stay on all night, just like how most people leave their electric lights on all night. They should not be more of a burden than using electric lights either. When choosing the best solar powered Christmas lights, most people do not want many changes, but they do want to help the environment. Being environmentally friendly is becoming more popular as more people become aware of their impact, and these kinds of light can make your holidays greener. Today, we will take a look at the AMIR solar powered string lights. The AMIR solar powered string lights are different from many of the other brands we have reviewed for you. These light strands are much thinner and have smaller lights. While these may not be the most ideal for a massive Christmas tree, they seem to be much better suited for other decorating purposes. This includes across the mantle, down the banister, in a gazebo, or in bushes and gardens. The thin strand makes it quite easy to hide the strand and let the lights shine. These lights also have a rating of 3.6 stars on Amazon, with 72 percent of customer reviews giving the product a rating of 4 stars or higher. For the most part, it seems that customers love these lights, so we are going to find out why. One aspect of the AMIR solar powered string lights that makes them environmentally friendly is their use of LED light bulbs. This is because LED lights need much less energy to operate when compared to incandescent bulbs. The average incandescent bulb needs about 6 watts to operate, whereas the average LED bulb only needs 0.8 watts. For string lights, you will probably need less than 20 watts to operate a strand of lights with 200 LED light bulbs, but string lights with 200 incandescent bulbs will need hundreds of watts to keep going. Consider how long you plan to keep your Christmas lights on each day during the season. The amount of energy the lights need really adds up after a while! Thankfully, LED string lights are much more energy efficient. The above paragraph talks about the energy needed to run the different kinds of bulbs, which can run up your electric bill every winter. Instead of reducing your electric bill every winter, you can not worry about the electric bill at all with solar powered string lights. These lights rely solely on solar energy, so you do not need to plug them in. Each strand comes with a solar panel attached on the end, so you can place it anywhere there is direct sunlight. This not only keeps your electric bill the same as normal, but it also allows you to run the lights all night guilt-free. These lights do not waste any energy at all. Another aspect of the AMIR solar powered string lights that sets them apart from their competitors is the long-lasting light. Many of the other brands we have reviewed list the typical run-time for their lights as six to eight hours and need just as many hours to charge. These solar Christmas lights, on the other hand, can run for up to 14 hours on an eight-hour charge. Obviously, you can only achieve that length of time if the solar panel has access to enough sunlight during the day. Customers love being able to see the lights come on in the evening and still see them on when they wake up in the morning. 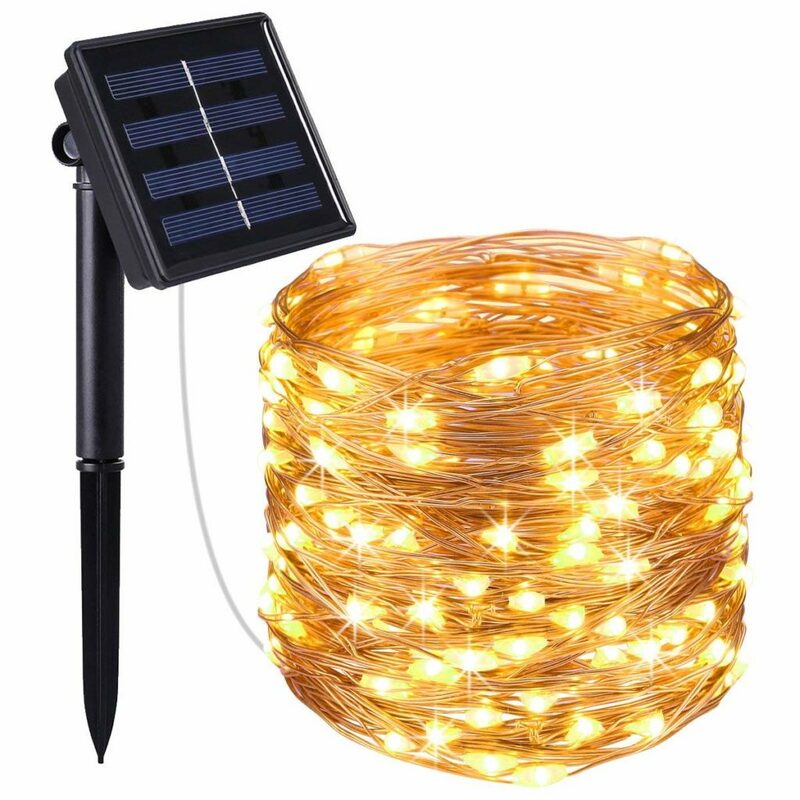 These solar string lights are also waterproof, making them great for outdoor use during the holidays. Many people experience rain, snow, and other weather this time of year, which can make decorating difficult. No one wants their decorations to fall apart or stop working after one bout of precipitation! Thankfully, the rain and snow will not ruin these lights. The lack of light during bad weather will definitely affect the amount of sunlight the solar panel has access to, but it will not ruin the panel. The AMIR solar powered string lights are $15.99 for a strand that is 72 feet long with 200 LED light bulbs. Each bulb is spaced a couple of inches apart. Each strand comes with a solar panel, a stake for the solar panel, and an instruction manual. These lights have eight different light modes for you to choose from, which allows you plenty of freedom to use the lights however you want. The different light modes include steady on, twinkling, slowly fading, chasing, fading, waving, fireflies, and a combination. Customer reviews do not state whether the lights will use the same mode each time they turn on. It is also great that these solar string lights let you use them as creatively as you want. Because they run on solar energy, you do not have to place the lights close to an outlet. All of the outdoor places you want to add lights are now an option for you with solar lights. There are many creative ways to hang solar string lights, and now you can give them a try! AMIR does not have a company website that gives information about them, unfortunately. Though we do not know their reasons for creating and selling eco-friendly products, it is great that companies like this exist. The popularity of these products adds competition to the market and encourages other companies to create high quality goods. With more and more people wanting to help the environment and make a difference, companies are starting to step up and meet the demands of the people. While solar powered string lights may seem like a small thing, it still makes a difference. The best aspects of the AMIR solar powered string lights are the ones that set them apart from the other solar Christmas light brands. They are very versatile, letting you add lights to areas all over your property without any worry. The strand is also quite thin, which makes it easy to hide the strand and only focus on the lights. These lights also seem to hold a charge better than some of the other brands. They still need the six to eight hours to charge like other brands, but they can run for up to 14 hours. Other brands advertise 12 hours at the most with direct sunlight, but customer reviews rarely claimed the same numbers. Customers are quite happy with the longevity of the AMIR lights. Also, the LED light bulbs are another great advantage to using these string lights. They are energy efficient, which puts less strain on the solar panel. The solar panel has to generate smaller amounts of energy to power the lights for much longer. LED light bulbs also last a long time, so you will not need to worry about replacing them for a while. The most common complaint about this product is its frailty. Several customers described the problem as wires disconnecting and going out after a while. Some of this may be due to the way the customers used the product, but it may also be due to the fact that these lights are cheap. Cheaper products typically have a lower quality. If you want to use these lights, you will probably need to handle them with care. Overall, the AMIR solar powered string lights are great for the price. They hold a charge longer than other brands and are versatile. The strand is long too, so you can cover some areas with a single strand. They also use LED light bulbs, which last longer and are energy-efficient. If you want to try these solar lights for yourself, you can grab them off of Amazon for $15.99 a strand. Using solar powered string lights brings all sorts of benefits to you and the environment. They reduce your energy consumption, which cuts down on pollution in your community. A great immediate benefit of this is a lower electric bill. Americans spend a lot of money during the holidays, and these lights will help you put that money toward giving to others. If you do not think the AMIR solar string lights are for you, be sure to check out the rest of the best solar powered Christmas light reviews here at Green and Growing. You are sure to find the right product for you here. Here are some top questions that I found for people seriously considering buying the AMIR Solar Powered String Lights. Do I need to turn on the AMIR solar powered string lights every night? You do not have to worry about turning the lights on or off because they will turn on automatically in the dark. The sensor in the solar panel will take care of this for you. How big are the LED lights? Compared to many of the other solar Christmas lights we have reviewed here at Green and Growing, these lights are quite small. If you want mini lights, these will be perfect for you.